The QNX Neutrino RTOS for medical devices is a key component of QNX Software Systems' solution for medical device manufacturers. It is designed to help medical customers meet stringent regulatory requirements by reducing the time and effort needed in pre-market qualification activities. With the growing complexity of today's medical devices, regulatory scrutiny is becoming more stringent. Choosing a pre-qualified component with a known pedigree can significantly aid in the qualification process. 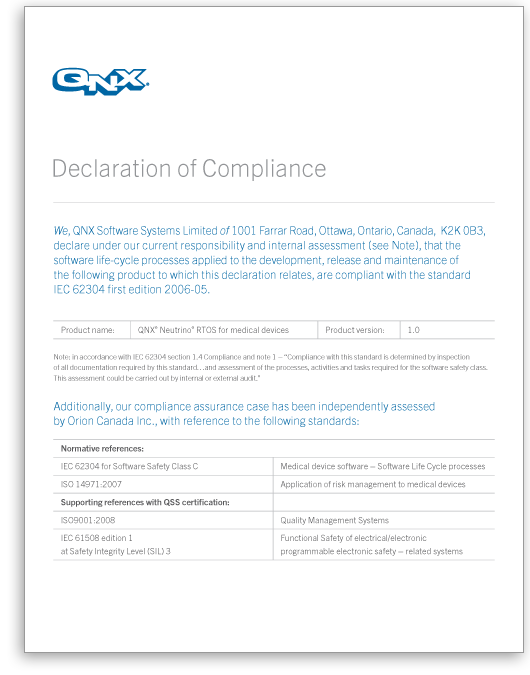 The QNX Neutrino RTOS for medical devices is qualified by an independent third party to be compliant with IEC 62304, a standard for "Medical device software - Software life cycle processes". The product is supported on ARM, Power, and x86 processors. With its unique technical advantage, proven track record, and professional expertise in building reliable and dependable systems, QNX Software Systems provides a trustworthy foundation for medical devices.